BOOKTRYST: A Book Marketing Ploy Worthy of "Mad Men"
Let's say you're a bookseller with a pile of unsold—and seemingly unsaleable—biographies of an 18th century British portrait miniaturist. What do you do? "Accidentally" drop a match? Make a very unwelcome donation to your local library? Not if you're the clever London bookseller Henry Sotheran Ltd. Oh, no. In that case, you tart those books up with a fancy binding that includes a never-before-seen feature and watch them fly off the shelves. 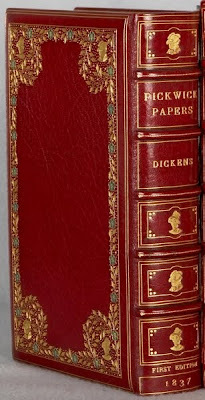 In 1909, the Sotheran firm had remaindered copies of a book on artist Richard Cosway that they needed to unload. 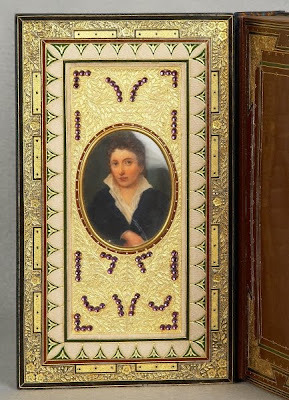 Some bright light at the firm hit upon the idea of having them bound in leather, and inserting a miniature portrait of Cosway in the cover (because Cosway painted miniatures—get it?). They were an immediate hit, and collectors demanded more. Thus did the "Cosway binding" come into being. 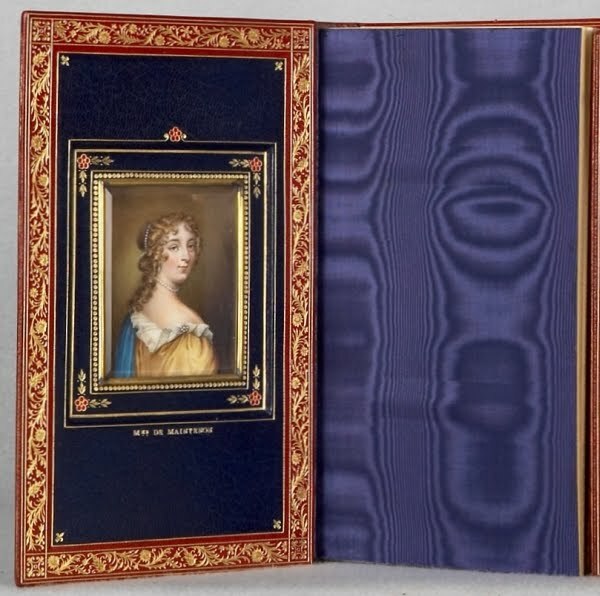 Sotherans employed a talented artist, Miss C. B. Currie (who also painted fore-edges), to paint miniature portraits on ivory of various authors. 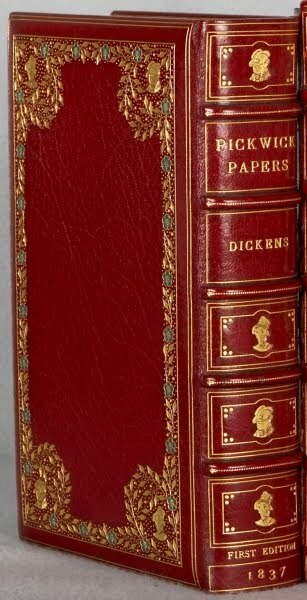 They engaged the Riviere firm to bind the books in their usual fine style, usually following designs by J. H. Stonehouse. 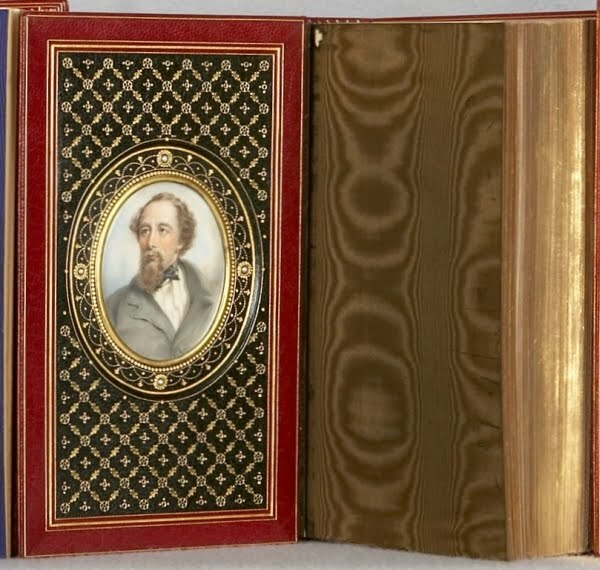 The Riviere binding on Dickens' Pickwick Papers, pictured above has "Cosway Binding" and "Invented by J. H. Stonehouse" stamped in gilt on fore edges of boards. 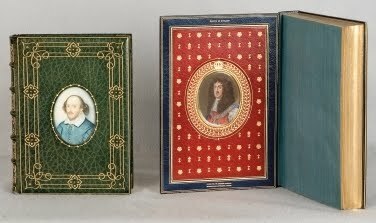 Some Cosway bindings have the portrait set into the front cover, as does the book on the left, below; most, like the book on the right, have the portrait set into the front doublure. 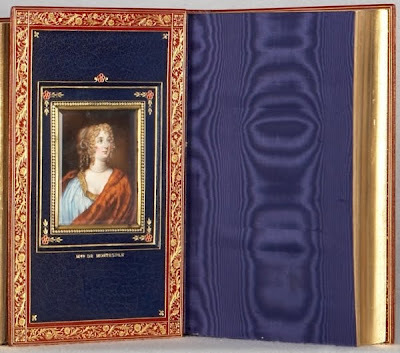 We know more or less for certain that Currie did at least 950 miniatures in her lifetime, as a Cosway binding that sold at Christie's on 12 July 2000 bore that number. She worked for Sotheran for some 30 years, until her death in 1940. The popularity of Cosway bindings insured that there would be imitators, and there was none better than Riviere's great rival, Sangorski & Sutcliffe. 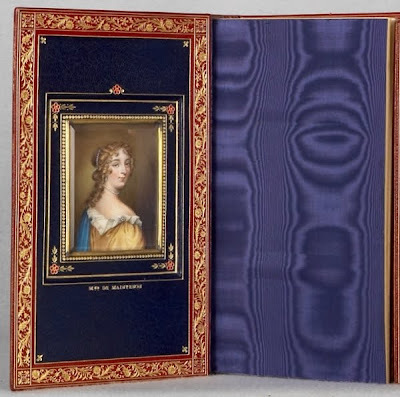 These artisans often incorporated a Cosway style miniature in their dazzling jewelled bindinga, to great effect. Rarely, if ever, in the history of marketing has a sales gimmick resulted in so many beautiful works of art. Don Draper would be proud--or jealous. All images courtesy of Phillip J. Pirages Fine Books & Manuscripts.